Sanitation in Dakar, Sengal is an ongoing challenge for many of the city’s poorest residents. For the nearly 1.5 million people using on-site sanitation, twice a year, they must make a decision about how to empty their latrine. Historically, many of them choose to pay someone to do it manually, though the contents are often then dumped in the surrounding area, creating a health risk for children. 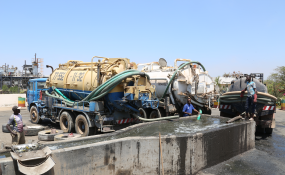 AAE Professor Laura Schechter has been working with colleagues to create a more efficient solution to Senegal’s sanitation problem, through the use of technology. A lack of access to capital, combined with limited information and low levels of competition have all contributed to people’s decision-making surrounding sanitation. With funding through the NGO Innovations for Poverty Action and the Bill and Melinda Gates Foundation, Schechter has been piloting a central call center which allows individuals to get multiple quotes for emptying their latrine, and helps them make more informed decisions. They have also been experimenting with access to mobile savings options, so there are better ways to have the necessary cash on hand when the time for cleaning comes, as well as developing mobile payment options.